Mike Ashley says he’s “hopeful” of selling Newcastle United – and he’s keen to do a deal before the transfer window opens. Ashley last night revealed that he was in talks with more than one party over a sale. The announcement by the club’s owner is understood to have caught senior figures at the club by surprise. Manager Rafa Benitez has been identifying potential transfer targets with head of recruitment Steve Nickson ahead of the January window. 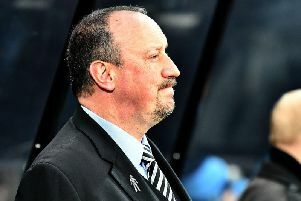 Benitez, Newcastle’s manager, has held talks with managing director Lee Charnley, though he has insisted that he is yet to discover his transfer budget. It is unclear what will happen regarding transfers next month should the club stay in Ashley’s hands. Ashley – who forced Benitez to sell to buy in the summer – himself acknowledged that a sale this month was more “possible” than “realistic”. Speaking to Sky News, Ashley said: “I’m hopeful – for the Newcastle fans, for the club, for everybody, that I will be able to step aside and we will be able to get an owner in that will please everybody. “I’d like it to be before the January transfer window. Ashley – who put the club up for sale 14 months ago – is looking for upwards of £300million for United. The rare interview came after fans protested against his 11-year tenure as owner by walking into Saturday’s game against West Ham United at St James’s Park in the 11th minute. A 3-0 defeat left the club 15th in the Premier League ahead of tomorrow night’s game against Everton at Goodison Park. Some supporters are also planning to boycott Sunday’s home game against Wolverhampton Wanderers. Benitez’s contract at St James’s Park runs out next summer, and the 58-year-old is unlikely to stay on if Ashley remains owner unless the billionaire backs him in the January window.